On April 2nd, a debate called 'More Clicks Fewer Bricks: The Lecture Hall Is Obsolete' took place on the popular debate platform Intelligence Squared. The panelists were there to discuss whether or not online classrooms, degrees, and MOOC's (Massive Online Open Courses) will fundamentally change or merely complement traditional classrooms and universities. Anant Agarwal and Ben Nelson were for the motion, arguing that online learning would overtake physical classrooms. Agarwal is the CEO of edX, a platform that delivers free online courses from prestigious universities like Harvard, MIT, and Berkeley University. Nelson is founder and CEO of the Minerva Project, a unique educational institution for gifted, motivated students. Against The Motion were Jonathan Cole and Rebecca Schuman. Cole is John Mitchell Mason Professor at Columbia University, where he teaches and has previously been Dean of Faculties and Vice President of Arts and Sciences. Schuman is a Ph.D., author, and teacher. She writes about the role of adjunct and contingent faculty in the U.S., and teaches literature, composition, and German. Agarwal began the debate, arguing that education has not kept pace with the recent developments of communications technology, and this needs to change. 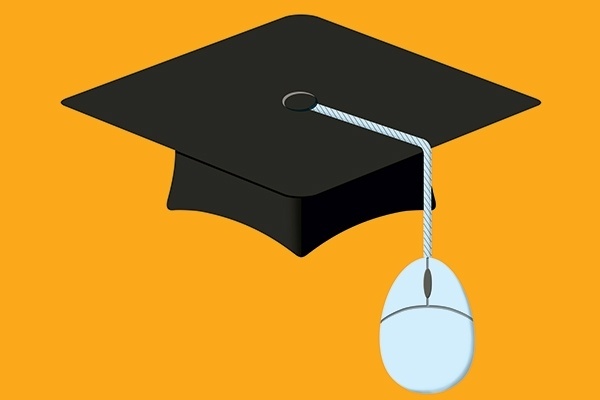 Online learning takes the 'factory mentality' out of education. Instead of having a classroom full of students with one lecturer, and often only one chance to hear the information, the Internet gives students the opportunity for self-based learning. Self-based learning is guided by the student, instead of an instructor. People using MOOC's can watch videos as many times as they want, pause, and rewind as much as they need. Teaching systems can be designed that are more interactive and provide instant feedback, helping students learn quicker. Agarwal also put into perspective statistics about MOOCs that are often misrepresented. For example, yes the circuits and electronics class had a completion rate of about 5%, but there were over 7,000 students who completed the course...an amount that would take a professor 40 years to do in a traditional classroom! Next, for the other side, Cole argued that online education would not replace traditional universities, but will serve to augment them in certain ways. Virtual learning has its benefits, he conceded, but there are many cases and types of knowledge that can't be taught very well online. These are courses where more critical thinking and arguing needs to be done, where communities need to collectively analyze and understand information. Ben Nelson responded to Cole, saying that online education is a new phenomena, and the bugs in it are quickly being worked out. He also made the point that virtual classrooms are more economically sustainable when it comes to higher education, compared to paying a professor hundreds of thousands of dollars per year to teach just one or two courses. Rebecca Schuman spoke next, replying that some students need the face-to-face interactions they get in a traditional classroom to develop important life skills, and that this is the vital factor that online learning leaves out. She said that students having a hard time with school are more likely to drop out when taking online classes, and they are less likely to seek out help and develop useful contacts. The Motion that online education will win out against traditional classrooms won the audience vote. 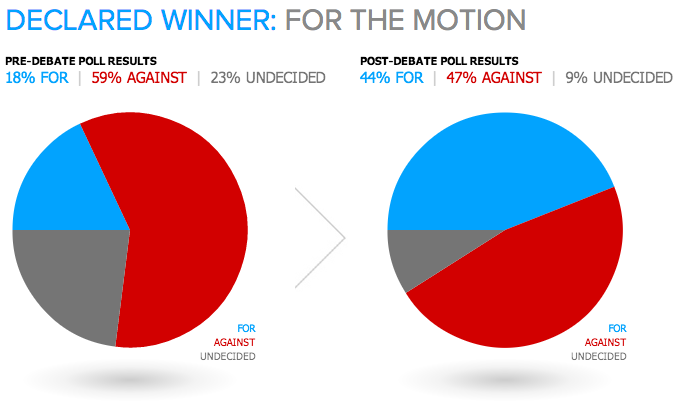 With only 18% of the audience beginning on that side, the debate ended with 44% convinced, an increase of 26%. On the other side, 59% began the debate thinking that physical classrooms would remain as they are, and after the debate only 47% thought so, a loss of 12%. Many insightful and relevant points were made by both sides during the debate. The overriding perspective towards the end was that online education, while not perfect and equivalent to traditional education in every way, offers an incredible opportunity to learn for a vast number of people who would never be able to otherwise. The Internet has become such a powerful and ubiquitous force that it can bring a high-quality education to almost anyone, anywhere in the world, as long as they have a connection and a device. This fact can't be overstated, and it's one of the most important results of having a networked world.